The best cartoon in the history of the universe, bar none, is Rocky And His Friends, otherwise known as The Bullwinkle Show. Their incredible combination of political commentary, silly animation, rapid-fire delivery and horrible puns was, and is, unique, and the show still has a cult following even now, over thirty years later. SCENE: College campus. 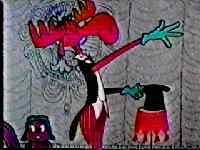 Rocky and Bullwinkle come across a disguised Natasha, weeping. Rocky: Hold it, Bullwinkle! That sounds like a lady in distress! Rocky: Gee, didn't you ever read the Hero's Handbook? 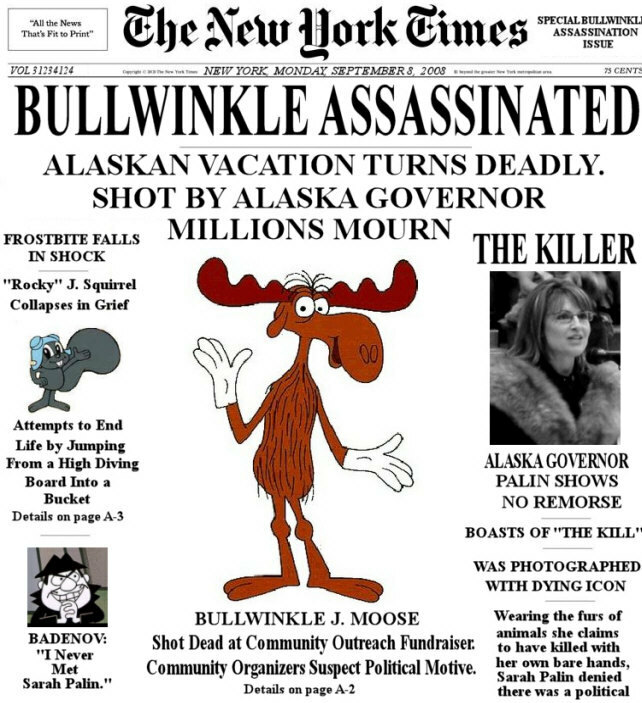 Bullwinkle: I can never get past the picture of General MacArthur on the cover. Rocky: Well, Chapter Two says we should always help ladies in distress. Bullwinkle (to Natasha): Hi, there, lady! Are you in distress? Natasha: This dress, that dress, who cares? I'm distraught! Bullwinkle (to Rocky): Do we help ladies in distraught? I was originally planning to devote a large amount of web-space to the subject, but Charles Ulrich has already been so thorough with the Frostbite Falls Home Page that there's little left to be said. There is one more story, however, which is worth telling. A handful of the later Rocky and Bullwinkle cartoons dealt with a small island called Moosylvania. Less well-known is that producer Jay Ward actually bought a small island on a lake in Minnesota, which he named "Moosylvania", and proceeded to set up a petition drive and nationwide tour to give Moosylvania statehood - "the Only State in the Union with an Entirely Non-Resident Population". We got this van, this poor van with this calliope that played circus music, and we took off cross-country and we visited fifty, sixty cities... 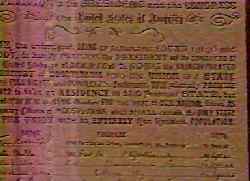 It culminated when we got to Washington, D.C., and Jay had this huge list of names - signatures, for statehood for Moosylvania. And we got into the van, and we were accompanied by Pat Humphrey, who was Hubert Humphrey's daughter-in-law, who was the NBC representative. Jay was driving the van, she was next to him and I was sitting in the back - hiding in the back is more like it - and we got to the White House gate, and the [entrance guard] said, "What are you doing?... Turn off that music!" And Jay said, "We're here to see President Kennedy. We want statehood for Moosylvania." And the guy said, "Turn around and get out of here!" And Jay said, "You know, you could be civil. I mean-"
I said, "Jay, turn around!" "No. I don't like his attitude." Of course the guy then started to unbuckle his revolver. And I panicked. "Jay, let;'s get out of here!" And Jay didn't like his attitude. "Well, I will, but I mean the man is absolutely rude." And we turned around and left. That afternoon I took the photographs that were taken of us in the car by the White House and I went to the [Associated Press] office and I said, "Look, we tried to get into the White house and they wouldn't let us! I thought Kennedy had a sense of humor." He said, "Come, let me show you something." We had arrived at the White House on the day of the Cuban missile crisis. So nobody paid any attention to us, even though we were very funny. That ended the tour, and we drove back home.Never did get statehood for Moosylvania, either. 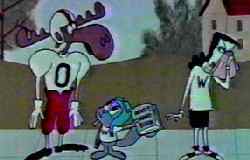 Notably, in the cartoon Rocky and Bullwinkle ultimately succeeded in getting their petition delivered. 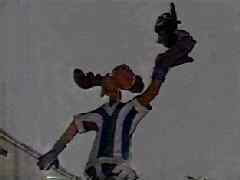 Rocky: Well, that's it, Bullwinkle! It's filed! Bullwinkle: You mean Moosylvania's gonna be a state now, Rock? Rocky: That all depends on how many good Americans get behind it, Bullwinkle. Narrator: But will Rocky and Bullwinkle be joined in support by people everywhere? Or will the same sinister forces that defeated the Snooky Lanson presidential boom be at work again? Perhaps we'll find out more in further adventures of Rocky Squirrel and Bullwinkle J. Moose! Left: Photo from the Coney Island Film Festival, 1964. Right: Statue of Rocky and Bullwinkle which stands on Sunset Boulevard. A Small Request: Sometime in the mid-1980s, one of the northeastern states of the U.S. (possibly Maine?) had an election where the legality of moose-hunting was on the ballot. One group opposed to the hunting ran a television ad which featured Rocky and Bullwinkle doing their standard "pulling a rabbit out of a hat" gag... only at the end, instead of pulling out the usual lion or rhino, Bullwinkle reached into the hat and pulled out a hunter with a double-barreled shotgun. If anybody reading this has a videotape of that ad, would you mind e-mailing me? I'd like to make arrangements to see a copy.